The following sections present an overview of the property zone parameters required for flow and transport models in Visual MODFLOW Flex. A steady-state groundwater flow model requires conductivity and initial heads property values for each active grid cell in order to run a flow simulation, while transient flow models also require storage properties for each active grid cell. Similarly, a transport model requires various model and species parameter values for each active grid cell in order to run a transport simulation. 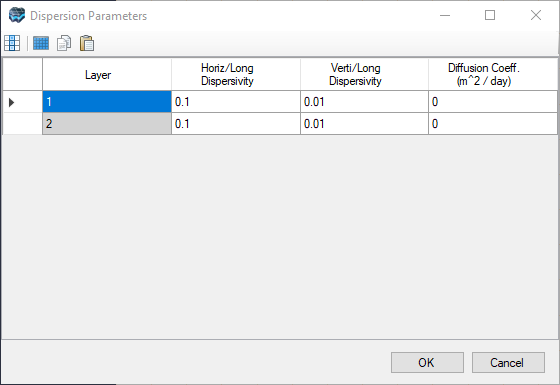 Upon creating a Visual MODFLOW Flex project, the default flow and transport parameter values are assigned to every grid cell in the model domain. This will ensure the model has the minimum data required to run a simulation. However, in most situations, the flow and transport properties will not be uniform throughout the entire model domain, and it will be necessary to assign different property values to different areas of the model. Heterogeneous property values are supported by Visual MODFLOW Flex using either Constant Value Property Zones, or Distributed Value Property Zones. These two different approaches are described below. The Constant Value Property Zones approach is the most simple and straight-forward, and can be used for all model properties supported by Visual MODFLOW Flex. Different model properties are accommodated by grouping grid cells sharing the same property values into “property zones”. Each property zone will (normally) contain a unique set of property values, and is represented by a different grid cell color. The Constant Value Property Zones approach requires the development of a conceptual model, whereby each hydrostratigraphic unit of the model is assigned a uniform set of property values. For example, consider an aquifer where there is pumping test data and slug test data indicating a range of horizontal conductivity values from 1x10-4 cm/s to 5x10-4 cm/s at different locations within the aquifer. The conceptual approach would assign a uniform Kx and Ky value of 2.5x10-4 cm/s to the entire aquifer. This value would be adjusted up or down for calibration purposes within the range of values reported. If a reasonable calibration cannot be achieved using this conceptual model, it may be necessary to sub-divide this region into several zones to accommodate local irregularities in the flow pattern. However, almost all modeling textbooks strongly recommend starting out simple at first, getting as close a solution as possible, and then making the model more complex, if necessary. The Distributed Value Property Zones approach is available for flow properties (conductivity, storage, and initial Heads), and most transport properties (e.g. initial concentrations, longitudinal dispersivity, sorption parameters). This approach is a little more complicated than the constant value property zone approach because it involves linking a property zone to one or more parameter distribution arrays containing data interpolated from scattered observation points. When a property zone is linked to a distribution array, the property values assigned to each grid cell within that zone are calculated by multiplying the zone parameter value with the corresponding value from the parameter distribution array. If the grid spacing from the model does not match the grid spacing from the distribution array, a bivariate interpolation scheme is used to calculate the appropriate parameter value at the center of the model grid cell using the four nearest data nodes in the parameter distribution array. These conductivity parameters may be defined on a cell-by-cell basis using constant property values and/or distributed property values. When importing or assigning the conductivity property zones, Visual MODFLOW Flex will require valid data for each of the above parameters. Please Note: The anisotropy option is set in Translation settings. (see Anisotropy for more details). If the 'Anisotropy by layer' option is used, the Kx value will determine the conductivity in the X-direction, and the specified anisotropy ratio (Ky/Kx) for each layer will be used to calculate the Ky value for each grid cell. If the 'Anisotropy as specified' option is used, the model will use the Kx and Ky values defined for each property zone. Specific Storage (Ss) is defined as the volume of water that a unit volume of aquifer releases from storage under a unit decline in hydraulic head due to aquifer compaction and water expansion. Visual MODFLOW Flex determines the primary storage coefficient (sf1) for MODFLOW based on the user defined Specific Storage parameter. The primary storage coefficient is calculated by Visual MODFLOW to be equal to the specific storage multiplied by the layer thickness (Specific Storage x thickness = Primary storage coefficient). Specific Storage is is only used in transient simulations. Specific Yield (Sy) is known as the storage term for an unconfined aquifer. It is defined as the volume of water that an unconfined aquifer releases from storage per unit surface area per unit decline in the water table. For sand and gravel aquifers, specific yield is generally equal to the porosity. MODFLOW uses Ss or Sy depending on the layer type assigned by the user (please refer to "Layer Type Settings"). For an unconfined layer, MODFLOW uses Sy to determine storage volumes. For a confined layer, Ss is used. For a variable layer, MODFLOW will check the head value of the cell to determine if it is confined or not. If you do not have measured parameter values for Sc and Sy it is recommended that you refer to literature values as a default. Specific Yield is only used in transient simulations. Effective Porosity (Eff. Por) is the pore space through which flow actually occurs, and is used by the particle tracking algorithms (MODPATH/MOD-PATH3DU) to determine the average linear groundwater velocities for use in time-dependent capture zones and time markers along pathlines. This term is not used for MODFLOW simulations. Total Porosity (Tot. Por) is the percentage of the rock or soil that is void of material, and is used by MT3D/RT3D/SEAWAT (by default) to determine the chemical reaction coefficients, and for calculating the average linear groundwater flow velocity in the particle tracking solution schemes. A different porosity is used for MT3D/RT3D/SEAWAT than for particle tracking because the transport engines account for additional transport and reactive processes, such as dispersion. The total porosity term is not used for MODFLOW simulations. These storage parameters may be defined on a cell-by-cell basis using constant property values and/or distributed property values. When importing or assigning the storage property zones, Visual MODFLOW Flex will require valid data for each of the above parameters. Please Note: MODFLOW-SURFACT supports the time-varying material properties (TMP1) package (as an add-on) where the flow properties may change over time, as discussed here. In order to start solving the flow simulation, flow engines require an initial “guess” for the head values in the model. A good initial guess for the starting heads of the simulation can reduce the required run time significantly, while a poor initial guess can increase run times or lead to stability and/or convergence issues. The Initial Head values are also used to calculate drawdown values, as measured by the difference between the starting head and the calculated head. The vadose zone object is only available when an unsaturated flow model (MODFLOW-2005 with the unsaturated zone flow (UZF) package or MODFLOW-SURFACT) is selected in the Modeling Objectives workflow step. The vadose zone, or unsaturated zone, extends from the land surface to the water table. The vadose zone typically has a lower hydraulic conductivity because some of the pore space is filled with air, and the soil moisture in the vadose zone only travels through the wetted cross-section of the pore space. The relative proportion of air to water in the pores can vary, and consequently the hydraulic properties of the porous media can also vary. * Source: " Average hydraulic conductivity properties of ARS soil texture classes", draft dated February, 2000 by J. Schaake. This expanded the work of others and included a total of 2128 soil samples. Wilting point is the fractional water content at 15 bar tension; field capacity is the fractional water content at 1/3 bar tension. * Used in Campbell’s equation. ref: Coby et al., A Statistical exploration of the relationship of soil moisture characteristics to the physical properties of soils, Water Resources Research 20(6): 682-690, 1984. ** Average values of the van Genuchten soil parameters obtained by experimental means (Carsel and Parrish, 1988) and also reported on page 180 in Contaminant Hydrogeology book by C. W. Fetter (1999). You may want to consider also the ROSETTA code for estimating the unsaturated soil hydraulic properties which can be downloaded from the US Salinity Laboratory website: http://www.ussl.ars.usda.gov. 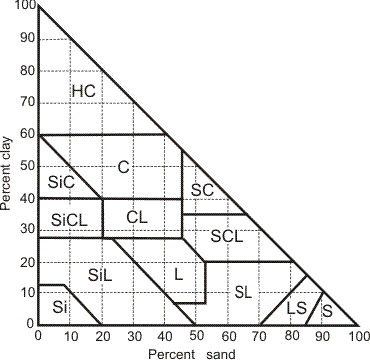 Figure: Soil texture classes triangle. EPS - (Brooks-Corey exponent ε) controls the air-entry pressure - the smaller the α value, the larger the capillary fringe above the water table. Gravels and sands have a large α while clayey soils have a small α.
THTi - (initial water saturation θi ) initial water content in the vadose zone. THTs - (residual water saturation θr) depends upon several factors of the soil including packing. Residual saturation values are generally low for sands and gravels and high for clayey soils. Residual saturation typically ranges from 0.01 to 0.4. Depending on the saturation model selected, the primary inputs for simulating groundwater flow in the vadose zone using MODFLOW-SURFACT are the van Genuchten parameters (α, β, and θr ) and the Brooks-Corey parameter (ε). The Brooks-Corey and van Genuchten empirical parameters can be measured in the laboratory for a given soil by plotting a soil-water characteristic curve. VANAL - (van Genuchten α parameter) controls the air-entry pressure - the smaller the α value, the larger the capillary fringe above the water table. Gravels and sands have a large α while clayey soils have a small α.
VANBT - (van Genuchten β parameter) controls how rapidly the saturation drops from unity to residual, and is an indicator of the grain size distribution. For larger values of β, the saturation drops rapidly with head (uniform grain size distribution), while for smaller values of β, the drop is more gradual (grain-size, and therefore pore size is more varied). β is greater than unity, but typically can be from 1.3 to 6, depending upon the soil. VANSR - (residual water saturation θr) depends upon several factors of the soil including packing. Residual saturation values are generally low for sands and gravels and high for clayey soils. Residual saturation typically ranges from 0.01 to 0.4. Brook - (Brooks-Corey ε) is the Brooks-Corey empirical exponent. It must be greater than zero (default value is 0.5). If no transport engine variant has been selected, the Transport Properties options will be disabled. If a transport engine has been selected then the following properties must be defined. In many cases, the historical conditions of the site are unknown, and the contaminant source has been removed or remediated. In such cases, the groundwater contamination is still present and the mass transport simulation must be run forward in time, starting from the existing conditions, to predict the potential downstream impacts. The Initial Concentration properties define the existing conditions of each chemical species at the start of the simulation period. Initial Concentrations must be defined for each chemical species that you have defined in the Define Modeling Objectives; the default value is 0. Model parameters consist of material properties associated with the geologic units that are independent of the constituent species to be modeled. The specific model parameters required as part of each simulation is defined by the retardation model and reaction model selected as part of the Define Objectives workflow step. The retarded flow velocity is used to calculate the advective transport of each species. Unless otherwise specified during the setup of the transport model, the default soil Bulk Density value for any new model created is 1700 kg/m3. If no sorption method is selected in the current transport variant, then no Bulk Density values are required for the simulation, and all of the options in the left-hand toolbar will be disabled. where IREACT is a flag in the RT3D RCT package file whose value determines which reaction module is active in the transport model run. Please Note: yield values associated with several reaction modules in RT3D are defined on a mg/L basis. To be consistent the user must use mg/L units for all concentrations when using these reaction modules. See additional notes for each reaction module. * Note: This reaction module describes a general double Monod model. By setting appropriate yield and kinetic constants, users can model any type of biological systems. Kinetic constants for an aerobic system are given in Clement et al. (1998), and for an anaerobic denitrifying system are given in Clement et al. (1997). Also see Taylor and Jaffe (1990); Hornberger et al. (1992); Zysset et al. (1994); and Reddy and Ford (1996). * Note: All the yield values are fixed internally; to be consistent, use mg/L units for all species concentrations. The Species Parameters include the Sorption and Reaction parameters used by the selected transport settings. The available parameters will depend on what sorption and reaction settings you selected in the Modeling Objectives workflow step. The parameters presented in the Species Parameters Database window are from the parameters listed in the Species Parameters Tab in the Modeling Objectives workflow step. If no sorption or reactions are selected in the current transport variant, then no sorption or reaction parameters are required for the simulation, and there will not be an option for "Species Parameters" at the Define Properties workflow step. The parameters are described by retardation model and reaction model below. The list of parameters required for each species based on each retardation model is provided below, associated base units are provided in square brackets [ ], where L signifies length (e.g. meters, feet), M signifies mass (e.g. kilograms, pounds), and T signifies time (e.g. seconds, days, years). A tabulation of which retardation model is supported by each of the transport engines is provided in the Define Modeling Objectives workflow step. For more detailed documentation on each of the retardation model parameters, please refer to the documentation of the relevant transport engine (i.e. MT3DMS, RT3D, SEAWAT, or MODFLOW-SURFACT). The list of parameters required for each species based on each reaction model is provided below, associated base units are provided in square brackets [ ], where L signifies length (e.g. meters, feet), M signifies mass (e.g. kilograms, pounds), and T signifies time (e.g. seconds, days, years). A tabulation of which reaction model is supported by each of the transport engines is provided in the Define Modeling Objectives workflow step. For more detailed documentation on each of the retardation model parameters, please refer to the documentation of the relevant transport engine (i.e. MT3DMS, RT3D, SEAWAT, or MODFLOW-SURFACT). Please Note: The RT3D reactions have specific default species for each of its associated reaction modules. Selecting a reaction module specific to RT3D will reset the species list and all associated species and model parameters. Caution: Actual (global) errors may exceed the local tolerances, so choose ATOL(i) and RTOL(i) conservatively. Dispersion is a physical process that tends to ‘disperse’, or spread, the contaminant mass in the X, Y and Z directions along the advective path of the plume, and acts to reduce the solute concentration. Dispersion is caused by the tortuosity of the flowpaths of the groundwater as it travels through the interconnected pores of the soil. Longitudinal Dispersion can be defined using the regular set of tools provided for most parameters (i.e. cell-by-cell, by layer/row/column, or using polylines/polygons/data objects). The Longitudinal Dispersion can also be defined on a layer-by-layer basis by right-clicking the Longitudinal Dispersion object in the model tree and selecting the Dispersion Parameters option. 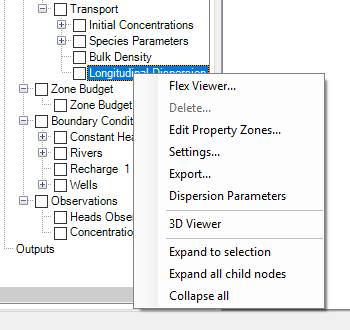 Longitudinal Dispersion can also be defined based on property zones by right-clicking the Longitudinal Dispersion object in the model tree and selecting the Edit Property Zones... option. The absolute values of the horizontal and vertical dispersion parameters will be adjusted according to the property zone values. For SEAWAT models, you can specify a diffusion coefficient for each species using the MDCOEFF variable at the define modeling objectives step. The values will be used if the Multi-diffusion option is set to true in the Advanced Settings for the DSP package in the Translation step.